As I was refilling the feeders this afternoon, some movement in the tree-tops caught my attention. 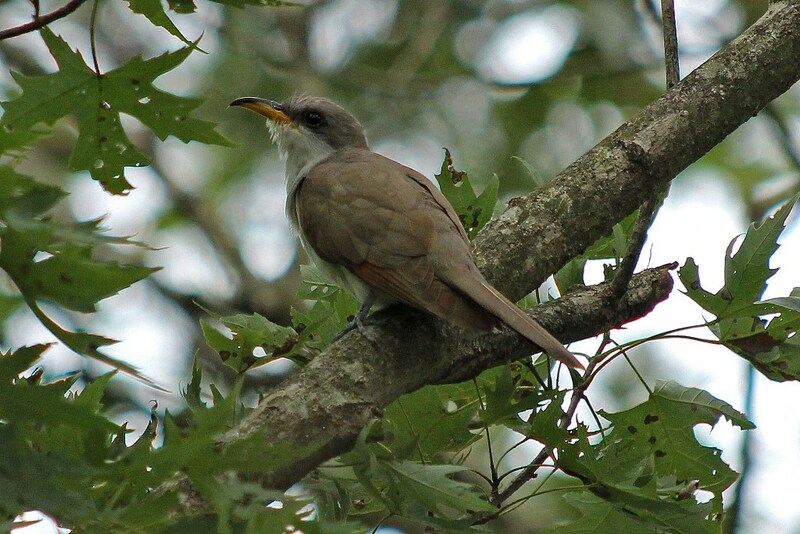 It was a bird that I had never seen before in my backyard. Up in the canopy of leaves, he was darn near impossible to get a clear picture of, but I fired off some shots with the hopes that I would at least get a good enough photo to identify this new-to-me visitor. 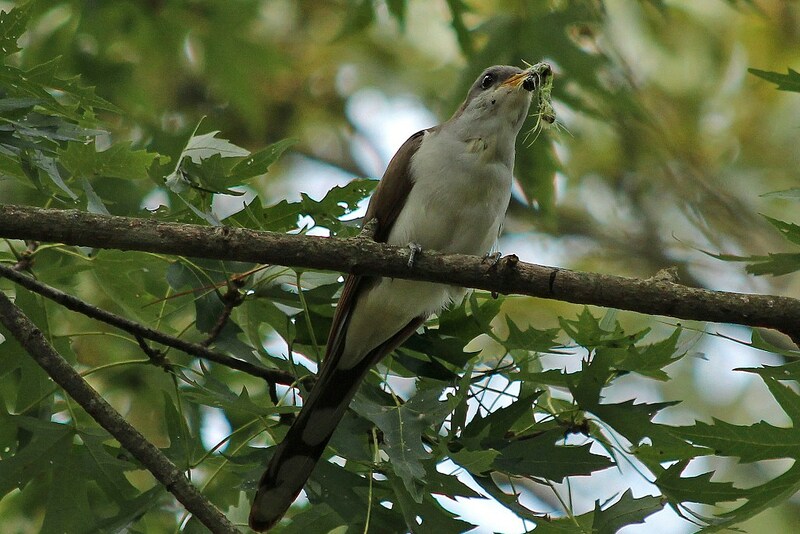 With the help of whatbird.com, we found out that our never-before-seen guest was a Yellow-billed Cuckoo bird! Now, to me, that name has a rare and exotic ring to it, and since I had never seen one before (or even heard of one before) I thought perhaps this was an Irma evacuee. 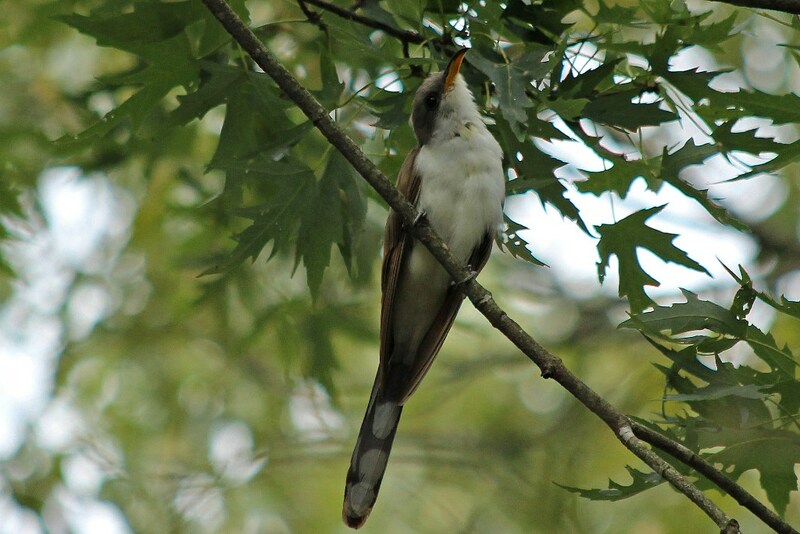 But alas, with a little extra research, we found out that this bird is found throughout the whole eastern half of the United States during the summer months. I tried using my telepathic powers to entice him to venture to a closer branch and then to pause and pose for me (channeling my inner aqua man…whom I did have a crush on as a young girl…okay, so I still have a crush on him…) but it would appear that my mental telepathy skills are as lacking as the rest of my mental faculties. 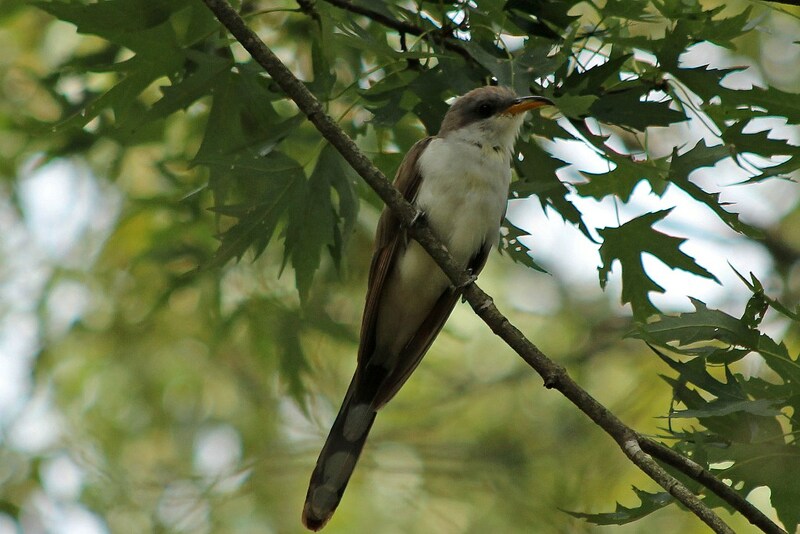 This entry was posted in Backyard Birds and tagged birds, Cuckoo bird, georgia, hobiies, nature, photography, writing, yellow-billed cuckoo. Bookmark the permalink. 15 Responses to An Irma Evacuee? 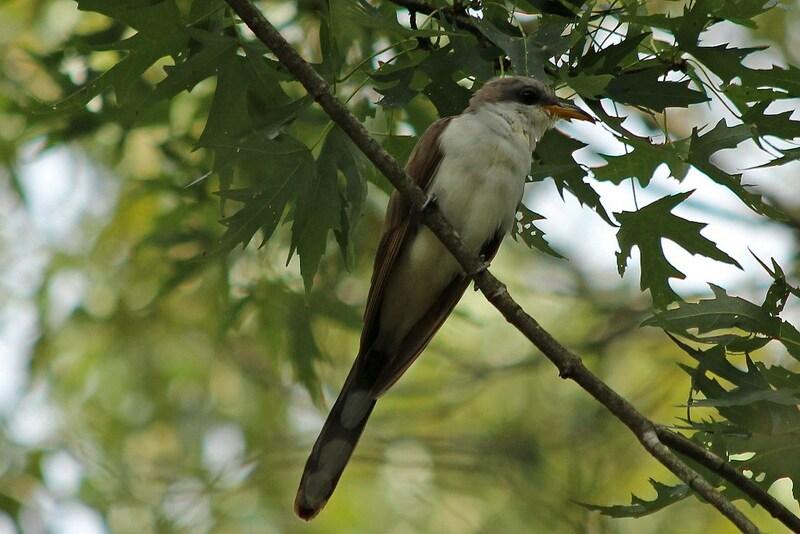 “Cuckoo! Cuckoo! Cuckoo!” How very special! I have lived in the eastern half of the US most of my long life, & I have never seen one either. Still haven’t, but I’ll sure be on the lookout! Always a thrill when you can make a new tick in your garden bird list, isn’t it Kathy!? Nice find! 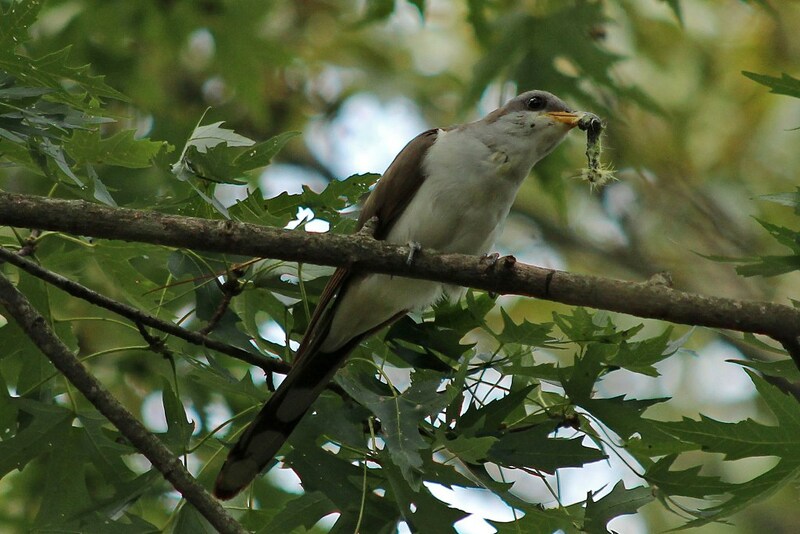 These birds are tough to see much less photograph. Lucky you! Great photos, I think. Never heard of these birds before, but you seem to attract them all. Must be that they recognize a bird brain when they see one! More like a bird sanctuary, I’d say. Quite a find! Lovely series of photos, thanks for sharing. Great photos, Kathy. I’ve only seen them from afar, and they seem to be very secretive and skulk through the vegetation. So, pat yourself on the back, because you got some terrific looks at him/her.